Joists, beam, posts, footings and me, in my natural habitat, using an ironing board as a drafting table. This example is from a 1950s-era ranch house, what you see here is a typical construction method. Even if you have a crawlspace and no basement, you have these same elements under your house if you have a home built with standard wood-frame construction. This supports the structure above. At the top you have the floor joists. Above the joists is sub-floor (plywood or decking or both) and above that is whatever your finish floor is (carpet, linoleum, tile). The joists are supported in the middle by a beam. The beam runs perpendicular to the joists and typically the joists are not continuous across the top. They might be butted end-to-end or, more commonly, you have two joists that run right next to each other overlapping a few inches at the beam. The reason for this is that the span across the space would be too great for joists of this depth, they would sag in the middle without a support. The beam is pretty cool. It’s a totally different thing and you cannot use the word interchangeably with “post.” You don’t want to confuse your builder or designer or the city! The beam is usually an impressively large piece of lumber. If your house is old, it may be a very strong, old growth, Douglas Fir – a beautiful piece of wood. Often there is more than one, butted against each other with both ends resting on the centerline of a post. Ideally, you would also see some metal connectors holding all this together but the beam(s) might just be sitting there on the post, lazily enjoying the quiet repose of gravity. Gravity takes on other dimensions in an earthquake which is why one component of seismic retrofits is to add steel fasteners that hold the joists to the beam, the beam to the posts and the posts to the footings. Yep, we should all be giving gravity the side-eye…. Posts are vertical support elements. If you’re ever trying to remember the difference between a post and a beam just think about fence posts. Fence posts are vertical to the ground. If they were laying on the ground, they wouldn’t be making much of a fence. Posts are vertical. They are doing the same thing (in part) for the beam that the beam is doing for the joists. They are reducing the span of the beam. Without them, a beam of this size would sag and that would not be a fun house to live in. Nobody likes a saggy beam. Posts are amazing! Posts are load carriers to the earth. They channel that gravity load very efficiently and they just set it down on the earth and you don’t hardly have to think about them at all unless you want to turn your basement into a roller rink or, more probably, a living room. Posts and beams in a partially finished basement with a finish ceiling and carpet. Here’s an example of a basement that lives below a gorgeous, two-story, 1912 beauty. It was partially finished with some insulated walls and a 1/2 bath. They used it as an occasional guest space and hang out space. We went through the full process to convert it to an ADU with full bath, mini kitchen, closed off bedroom (with egress window) and living area. But those posts you see there? They have remained. 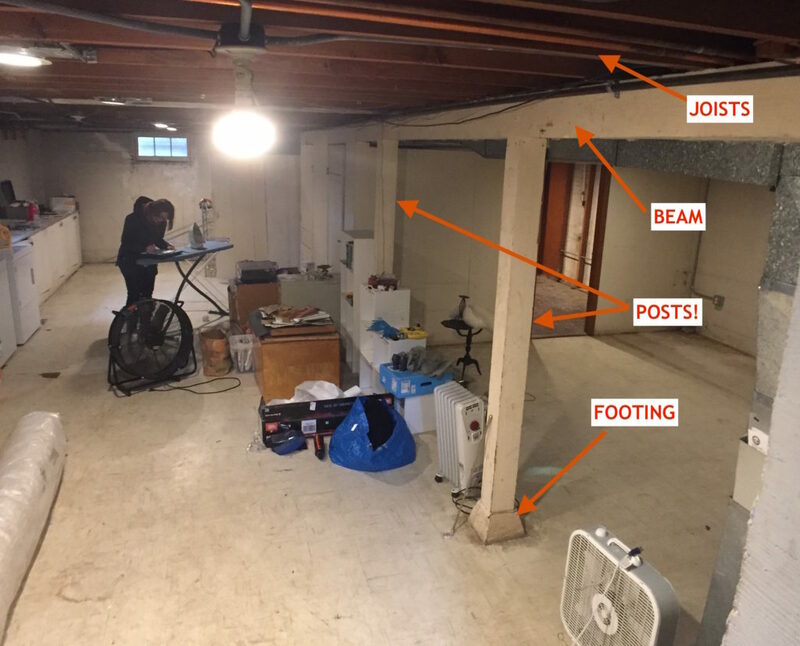 A necessary component of working in a basement space is reckoning with the limitations posed by the existing structural elements. Can you remove a post? The simple and short answer: sure. The longer answer requires a discussion of expense and engineering. Posts can be moved but you need to think through that load path and how you will account for it in the new plan. It may require a deeper beam to span a greater area – do you have the headroom? Each new post will definitely require a new footing which is created by excavating a hole and creating a new concrete footing at the right size and depth to meet code. All these adjustments are best taken with an engineer on hand to do the appropriate calculations. When submitting for permit to the city, they will want to see appropriate calculations that show that new posts and footings are located correctly and are adequate to do the job they need to do. For best bang for your buck, see if you can work them into your design. Posts can hidden in walls or closets if your floorplan allows for it. Be creative with your vision! But, it’s likely you’ll often end up with one or more out in the open. If this happens, make sure there’s enough room to navigate around the post and make sure that they can be clearly seen – don’t let someone turn a corner and walk into a post. I also recommend painting them white if you ever expect people to be walking around your newly finished basement in dim light such as in a bedroom space. 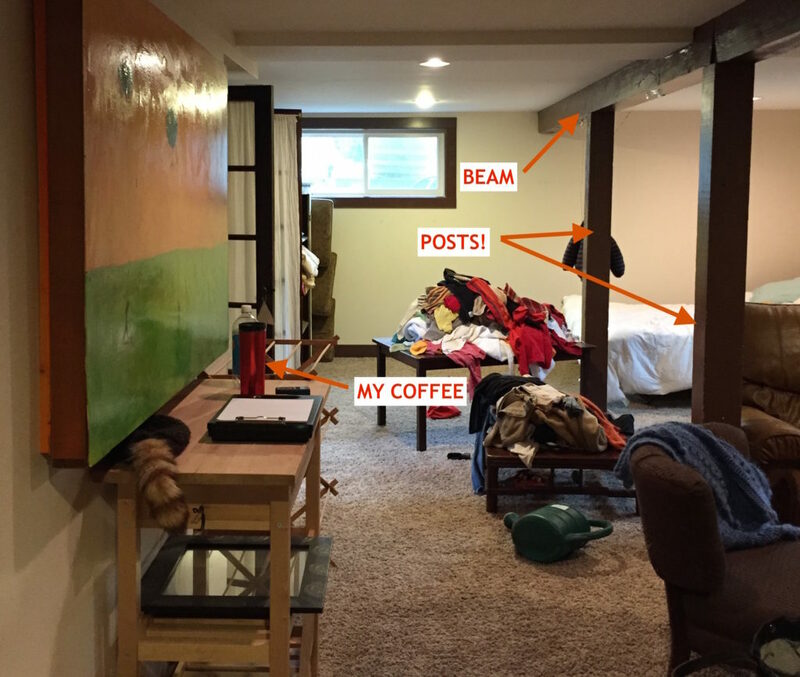 If you are converting a basement, embrace your posts! They are amazing!